Last night, Native Affairs had their first debate for the election. While Goff and Key both did appear in pre-recorded interviews on the show, both managed to say things that were likely to not sit well with the ideal readers of the show - Maori. Key repeated that New Zealand's economic woes were largely the result of movements in the international economy, and basically surmised that Maori unemployment was one of the unfortunate casualties of this. He repeated the National mantra of achievements: running large surpluses during the recession, and not cutting benefits in spite of "screaming from the right". He also took credit for the Greens' policy of insulating homes. More tension was evident when host Julian Wilcox asked him for his views on Tuhoe and the Urewera settlements. Key stated that while his government had done more Treaty settlements than the previous government, Treaty discussions were something he had in private and that should not be broadcast through the media, and that in his perspective the Ureweras should remain a national park. Goff, too, was fairly pedestrian in his replies. Knocking Key for his lack of focus on the internal policies that could mitigate the global financial crisis by putting forward his plans for increasing wages for all New Zealanders and working towards a more equitable tax policy, Goff focused on broad class politics that while popular with a group hit hard by unemployment, perhaps lacked the specificity for his audience. While his interview was good when placed in contrast with Key, Labour would be better positioned if they recognized the need to highlight Maori politics, particularly after the response to their ill-fated Foreshore and Seabed Bill. He also stated that he would work with any coalition partner aside from Hone Harawira, perhaps proving that Hone is the new Winston for the major parties. 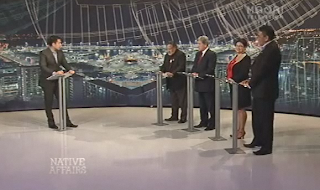 Then it was over to the leaders of four minor parties, who effectively stole the show: Winston Peters for New Zealand First, Metiria Turei for the Greens, Pita Sharples for the Maori Party and Hone Harawira for the Mana Party. Brash was absent because he is over in Europe researching New Zealand's potential response to the Eurozone crisis, a somewhat bizarre move four weeks out for the election which perhaps signals he has not yet discovered such technologies as the internet, the telephone or Skype. Part of the amusement of the first half of the debate was from the Twitter response to Turei's Minnie Mouse-like jacket, or as one Twitter respondent argued, it looked like she had stolen Prince Charles' ears. While I hate to mention this due to the fact I like her individuality (I myself have a tendency towards outrageous clothing choices), and politics degrading to clothing is somewhat boring, perhaps she should adopt right wing commentator Matthew Hooton's explanation on Radio Live of the National Party's approach to launching policies before getting dressed: check that it polls well with four out of five voters. Far more amusement came from the politicians' inability to control their faces during the reaction shots, seemingly unaware that the camera was cutting back to catch their turgid expressions. Peters and Harawira, unsurprisingly, seemed to provoke the most strained smiles from the others. Sharples looked like he had swallowed a toad when trying to explain to Wilcox how he would be able to effectively work with Brash in the event of a Maori-National-ACT coalition. In spite of Brash's comments on how Maori should be appreciative of being dragged from the stone age to civilization, Sharples said he would be able to work in a coalition, which somewhat deflected from Harawira and Peter's role as current poor boys at the table. The latter part of the debate was steered by Wilcox into a display of cross-party unity, signaling that Wilcox perhaps has a future in politics once he ditches television. The politicians struggled to distinguish themselves from each other over the Rena disaster and over issues of Maori poverty. Peters was on fine form, summarizing the National Party's approach to politics in catchy soundbites, proving that there is fight left in the old dog yet. Harawira proposed feeding children at a cost of $40 million and compensating for this by pulling New Zealand troops out of Afghanistan, announcing that politics was 'not rocket science'. Turei seemed a little jammed in the middle there with parties on all sides capitalizing on Maori poverty to leave her with a lack of differentiation on the pulling 100,000 kids out of poverty platform from the Greens. Turei countered the Green's previous stance by saying that they were happy to work with any party, perhaps reflecting some of the ire from Green voters when they initially attacked Harawira's party as a bunch of activists belonging in the 80s at the inception of their party. Wilcox ended the session by pronouncing that all parties were so similar that they could form a coalition, to which Sharples replied it is the way they achieve the goals that differentiates them. This should become clearer when the Treasury opens up its books at 2.30pm today, although chances are this will not dominate the news in a nation that is still basking in post-Rugby World Cup glow. Key's initial comments on needing coalition partners and it being rare for one party to govern alone demonstrated a decline in his previous confidence. This decline is due to the precarious fate of ACT, who seem to be incapable of convincing voters in Epsom that they are a better choice than National's Paul Goldsmith, who is currently riding at 37% in the polls. The Taranaki-Epsom vote switch deal seems not to be working, even though Goldsmith will be in parliament anyway regardless of the outcome of this electorate. All it would take now is Labour to encourage their voters to vote strategically for Goldsmith to eradicate ACT and the party is seriously in trouble. It also reflects the latest iPredict update, which shows that predictably the vote is narrowing as we get closer to the polls. The video of the Native Affairs debate is available here. "All it would take now is Labour to encourage their voters to vote strategically for Goldsmith to eradicate ACT and the party is seriously in trouble. " As tempting as tghat might be, Phoebe (and it's VERY tempting! ), for Labour to even hint at such a thing would put them in thre same category as National-ACT in terms of shonkey deal-making; manipulation; and rorting the electoral system.